This series on Russian culture, history, and art is intended to provide a larger context for those watching and listening to commentary on the Sochi 2014 Winter Olympics. Read about my background in Russian language and literature, and why I’m doing this series. I’m not always dedicated to starting at the beginning. Sometimes starting history with “the beginning” is tedious, and boring, and lame – but it feels like there’s some important groundwork to establish if we’re going to talk meaningfully about Russian history and culture. Plus, the beginnings are pretty darn cool. 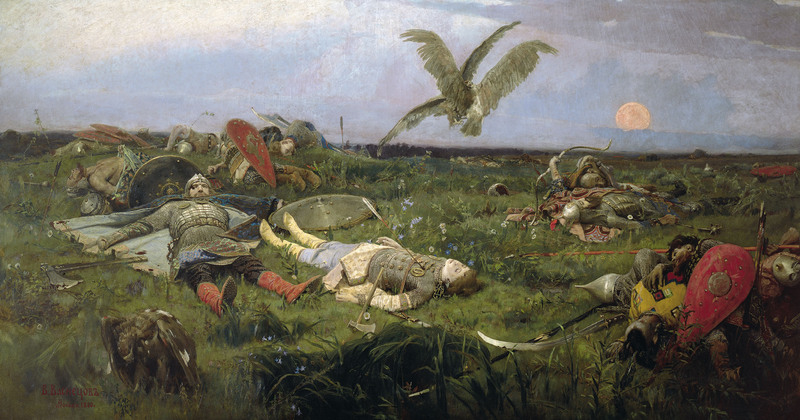 There’s a lot that happened in pre-historic Russia, but the beginnings of what we can now identify as Russian culture came with the Slavic people. Written language shows up in the Slavic world right around the 9th century, which is when we find the first documents written in Old Church Slavonic (also known as Old Bulgarian). By this point, the Slavs were the primary ethnic group in most of central and eastern Europe. The term “slav” in the original probably comes the old Slavic for “слово (slovo)” which means, fittingly, “word” – designating shared heritage with those who spoke the same language. Today, Russians, Belarussians, Poles, Czechs,Ukrainians, Slovaks, Bulgarians, Bosnians, Serbians, and Croatians are considered “slavic” people groups, and share this linguistic heritage. Interestingly, the English term derives from a misunderstanding of this origin, substituting the Latin “Sclavus,” meaning “slave”. If you know anything about how the slavs have historically been viewed as a people group, you know that this misunderstanding led to some very not-good things. In any case, slavic culture originates in the south slavic area – now known as the Balkans, and migrates north, east, and west. 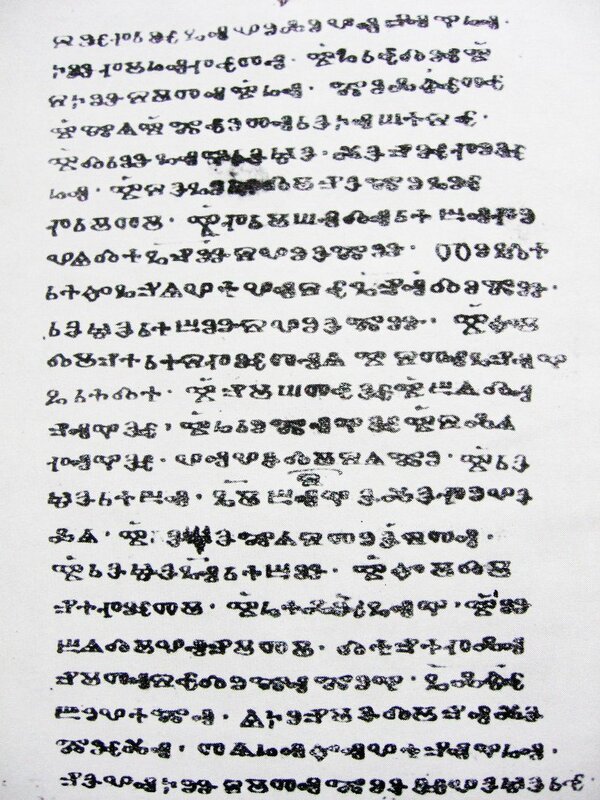 The first texts we have in written Slavic languages date from the 9th century, and were written in the Glagolitic alphabet in Great Moravia (what is now the Czech Republic). 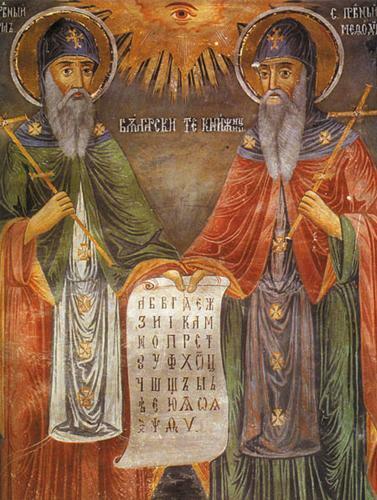 Saints Cyril and Methodius, brothers from Thessalonica who had been invited to teach the chrisitanized subjects of Prince Ratislav, are usually credited with the development of the first slavic alphabet, Glagolitic. Glagolitic was abandoned pretty promptly in favor of Cyrillic, which was a simplified version that had been developed in Bulgaria by Cyril’s disciples and named in his honor. Relatively few documents remain from these early writings, probably because they were written on birchbark and were therefore easily lost. Most of what we have are religious documents and translations of the New Testament which date from the 10th and 11th centuries. While south slavic priests in Macedonia and Bulgaria were codifying this language and putting it on paper, the first evidences of a Russian (/Ukrainian / Belarussian) state began to arise – Kievian Rus’. To call it a ‘state’ would actually be an overstatement – Kievian Rus’ was a loose affiliation of east Slavic tribes that was first based in Novgorod and then in Kiev. 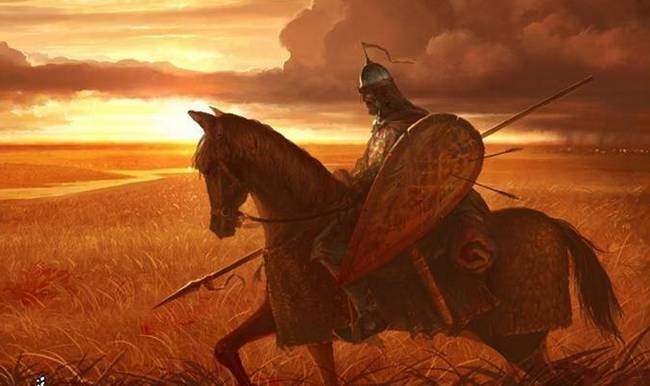 It started in the late 9th century, and fell to the Mongols in 1240. Correction: The above statement is true for the early period of Rus’, but after a point tribal boundaries were mostly disregarded, and the most accurate description of pre-Mongol Rus’ is probably “a loose affiliation of principalities”, rather than tribes. The literary legacy of Kievian Rus’ is found in two documents which date (arguably) from this period: the Primary Chronicle (повесть временных лет) and the Lay of Igor’s Campaign (слово о полку Игореве). Clarification: While the two works I reference are probably the most prominent pieces of literature from the period, I should point out that we have more than these two documents, including Ilarion’s famous Sermon on Law and Grace. You can read an English translation online here. There are a TON of fascinating things to study from this period, so if it piques your interest, dig deeper! If you’re interested in reading more, you should buy Medieval Russia’s Epics, Chronicles and Tales – it’s a solid anthology. Now Olga gave command that a large deep ditch should be dug in the castle with the hall, outside the city. Thus, on the morrow, Olga, as she sat in the hall, sent for the strangers, and her messengers approached them and said, “Olga summons you to great honor.” But they replied, “We will not ride on horseback nor in wagons, nor go on foot; carry us in our boats.” The people of Kiev then lamented, “Slavery is our lot. Our Prince is killed, and our Princess intends to marry their prince.” So they carried the Derevlians in their boat. The latter sat on the cross-benches in great robes, puffed up with pride. Thus they were borne into the court before Olga, and when the men had brought the Derevlians in, they dropped them into the trench along with the boat. Olga bent over and inquired whether they found the honor to their taste. They answered that it was worse than the death of Igor’. 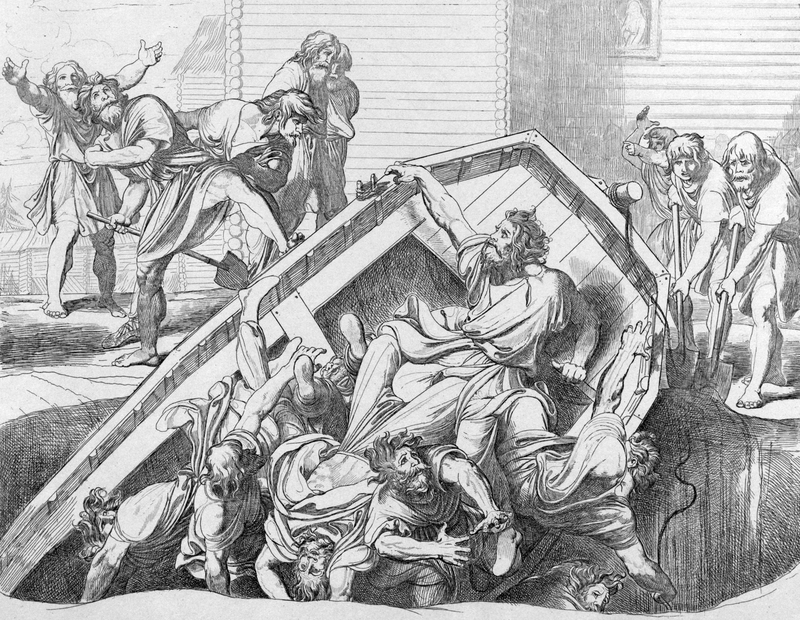 She then commanded that they should be buried alive, and they were thus buried. This is what Olga was all about. You can read the rest of the stories of Olga of Kiev here. If you’re a fan of fantastic (and riveting) medieval literature, I highly recommend reading the Primary Chronicle. You’ll also get a cool Slavic origin story, of pretty much everything that happened after Noah’s flood. You can read excerpts of the Primary Chronicle in English on the University of Toronto website. If you’re hooked, you can buy the whole (translated) text on Amazon. darkened from it by a shadow. “Brothers and companions! It is better to be slain than taken captive. and his zeal to taste the great Don veiled the omen from him. It’s also the first evidence of written slavic that’s NOT old church slavonic. You can read the rest of the Lay of Igor’s Campaign here, or buy a copy from Amazon. So that’s the start! Stay tuned for more samples of Russian history, culture, film, and literature! PS – Hopefully you’re also following me on my movie and TV reviews blog, Three Second Reviews. If you are, you’ve already seen my review of the beautiful animated short from 1975, Hedgehog in the Fog. Thanks! I owe much of what I know to you, so that’s pretty gratifying!